Despite all the hoopla about the power of social media tools in political campaigns, what metrics can we use to determine if those tools are effective? While just about anyone can set up a Twitter account or create a Facebook page, social media tools are only as effective as those who are using them. Although it is widely accepted that social media tools played a big part in President Obama’s 2008 campaign, that type of success is not guaranteed by simply using social media as part of a campaign strategy. When it comes to Maine’s 2014 gubernatorial race, which of the campaigns is best using social media? More importantly, how do we set aside our individual biases and evaluate the campaigns based solely upon their social media metrics? At the Brookings Institute’s Center for Technology Innovation, Darrell West offers a mixed review regarding social media and campaign engagement and the awkward transition to actual governance. Social media are the ultimate in disruptive technology. They change information delivery, business organization, online content, news coverage, and the manner in which individuals process new developments. As shown during the 2008 campaign, these digital tools represented a textbook example of voter mobilization and electoral impact. They were, in the words of Engage Partner Mindy Finn, the “central nervous system” of campaign organizations. Using social networking outreach tools such as Facebook, MySpace, YouTube, and Twitter, a number of Democratic and Republican candidates raised money, identified supporters, built electoral coalitions, and brought people in closer touch with the electoral process. You may recall a somewhat silly and lighthearted piece about Maine’s gubernatorial campaigns that I posted a couple of months ago. Then, I jokingly said we should dispense with the standard election process and use social media metrics to determine the winner. I examined each of the campaign’s current metrics. Today, I have decided to track those metrics on a regular basis and to blog frequently about those campaigns and their use of social media. Over the last 60 days, each of the Maine gubernatorial campaigns has been active on various social media platforms. But before we begin, it’s important to note that Democrat Mike Michaud is the latest entrant to this race. Both Governor LePage and Eliot Cutler carried over their respective social media support from the 2010 campaign. 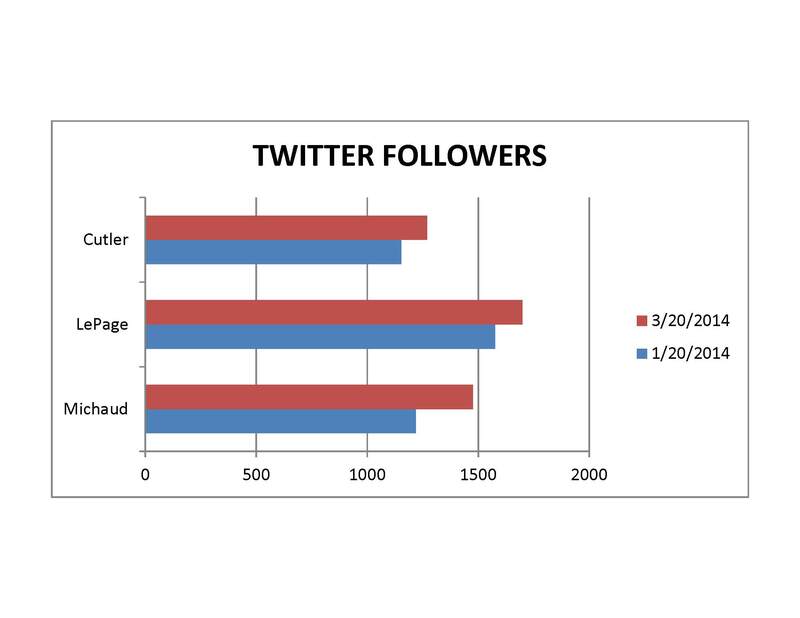 Nonetheless, Michaud has seen the greatest increase in social media traffic, earning a 21 percent increase in the number of Twitter followers @Michaud2014, moving from 1,219 Twitter followers on January 20 to 1,475 followers as of March 20, 2014. Although Governor LePage (@lepage2014) has the greatest number of Twitter followers (1,698) his metrics have increased only 8 percent during the same time period. Eliot Cutler (@EliotCutler) saw a 10 percent increase in Twitter followers, from 1, 153 to 1,269 followers during the same period. 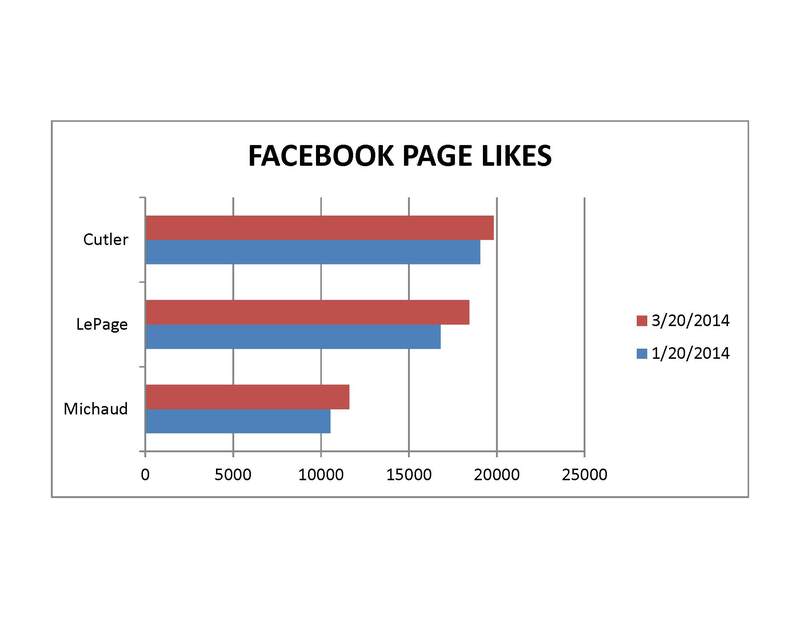 On Facebook, Cutler still dominates in the total number of Likes for his campaign page (19,824) but saw only a 4 percent increase over the last 60 days, while both Michaud and LePage experienced increases of 10 percent. LePage’s Facebook page had 18,438 fans on March 20, compared to 16,791 fans on January 20, 2014. Michaud’s Facebook page had 11,600 fans on March 20, compared to 10,529 fans on January 20, 2014. When viewed overall, it would appear that Team Cutler has the steepest hill to climb, so far. Note: Though it’s generally common knowledge, it must be noted that Twitter followers and Facebook fans do not translate directly to the number of supporters for a political candidate. As an example, I follow all three campaigns on Twitter, but will only be voting for one candidate. Pingback: All Along the Watchtower | LePage leads on Facebook; abandons Twitter?